Another visitor! Michelle was able to come and visit. You can see the difference in colour between the sanded and un-section of the ridge beam. 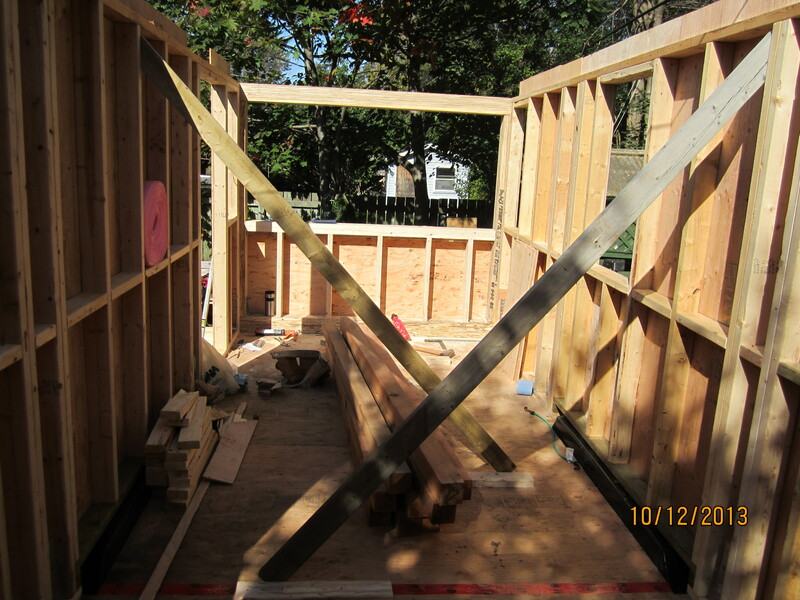 The bedroom loft with most of the siding up and a ceiling – just the dormer sides to do! 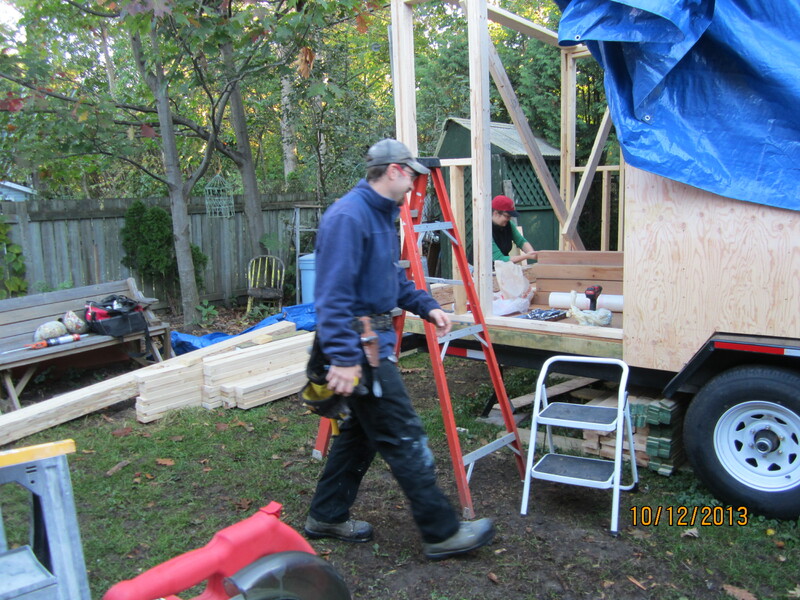 Another dormer – installing the siding on the dormers is a slow process. 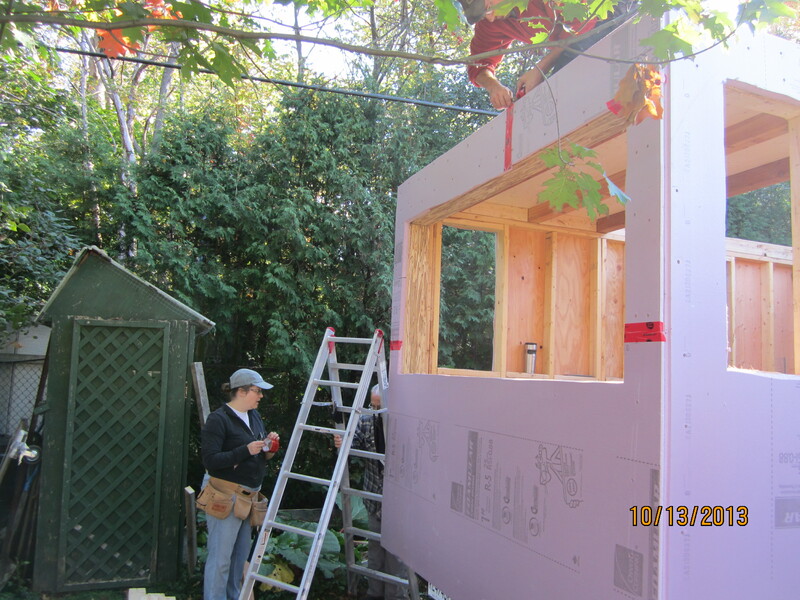 We started with the top full piece of siding and then did the two pieces above it. The top two pieces are long to do with all the cuts and the angles. I am really happy with how the siding has come out. 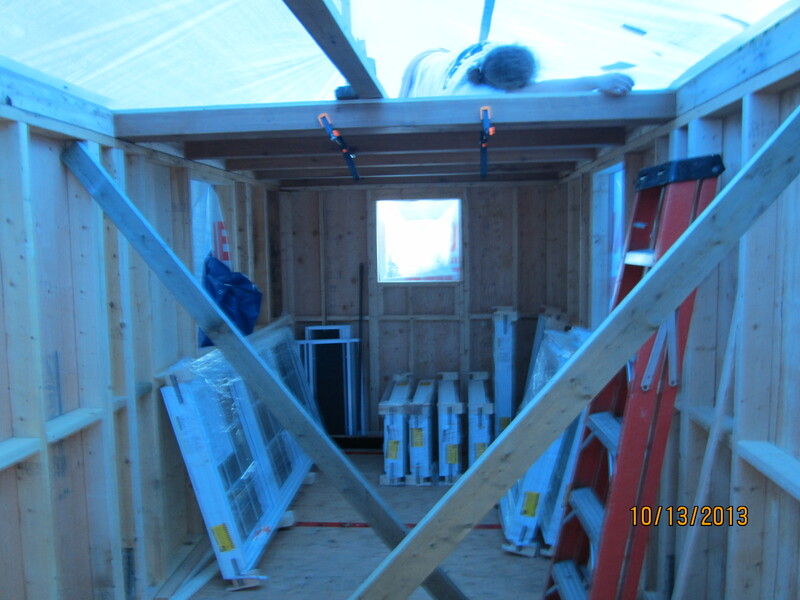 The small loft with all of its siding and ceiling installed. The purple is slowly disappearing. My door. The company I ordered my door from sent me a door that was ½” too short back in October. The new door arrived this week and was installed on Thursday. The window is a little crooked, but that’s an easy fix – it’s the same window as the door that was too short and I watched him put the window in, so with a little help, I can get the window squared away. Also note that there is a door handle and a lock! I have keys and everything. We had a mini thaw this weekend, the temperature got to 4C (39F) and the show started melting off the roof. This is the only snow left on the roof. This has been a wonderfully busy week for Tiny Refuge. The replacement for my door finally arrived and it was installed. The door they originally sent was 1/4″ too short, leaving enough space for the weather to get in. I have been waiting for the new door for months. Not only do I have a new door, I have a door handle and a deadbolt. Much fancier than the scraps of 2×4 that were standing in for a door handle. I spent quite a few hours this week sanding the ridge beam. I wasn’t sure if the ridge beam was going to be visible or not, so I didn’t get it sanded at the sawmill. It had a few dark marks on it and was rough enough that you could get splinters if you rubbed it the wrong way. I used a palm sander and got that ridge beam smooth. I am going to leave it exposed and as we installed some of the ceiling this weekend, it needed to be sanded before hand. 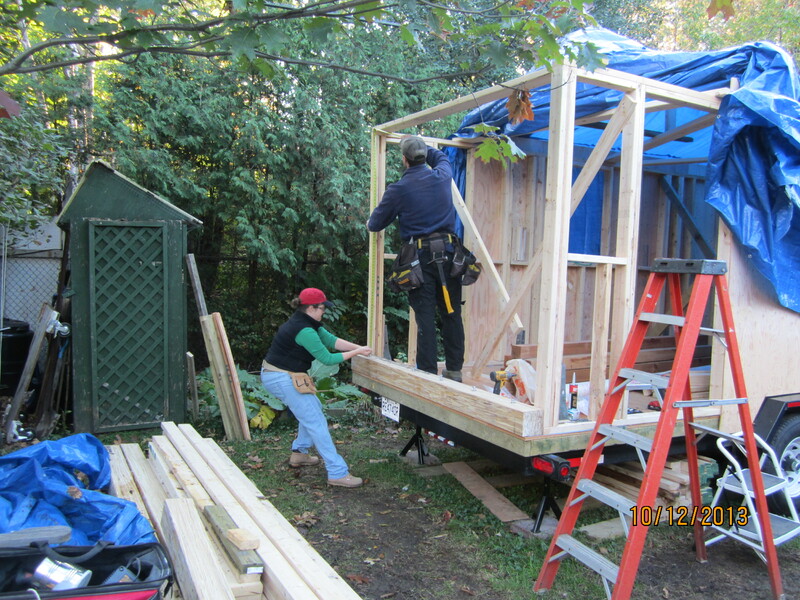 By the time Saturday rolled around, the tiny house was ready for some more siding. Saturday we finished the dormer fronts and the ceiling in the dormers. The dormer fronts were pretty straightforward, with far fewer cutouts than the main floor. The ceiling on the other hand was a little more challenging. I am using wider boards on my ceiling and unlike the walls, where I manned the saw and Stefan did the installation, we were both up in the lofts getting the boards in place. 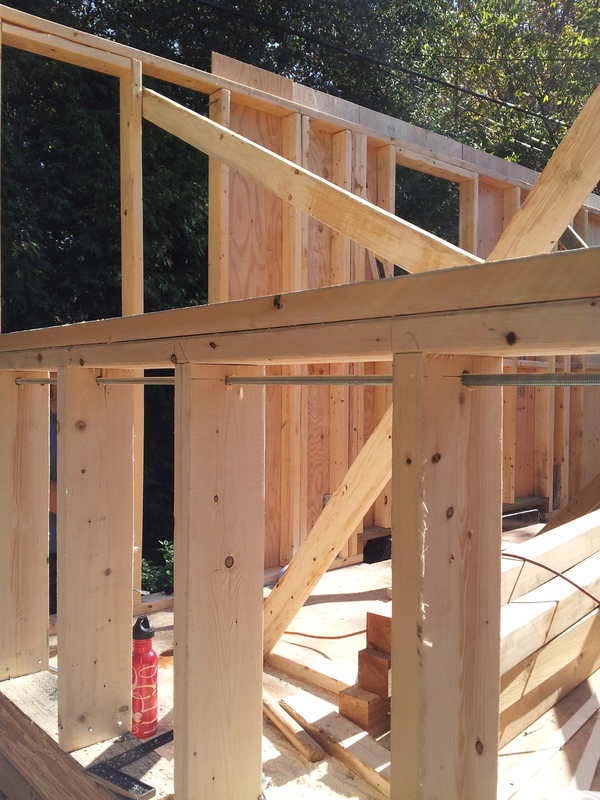 We started the installation at the ridge beam and then worked towards the walls. 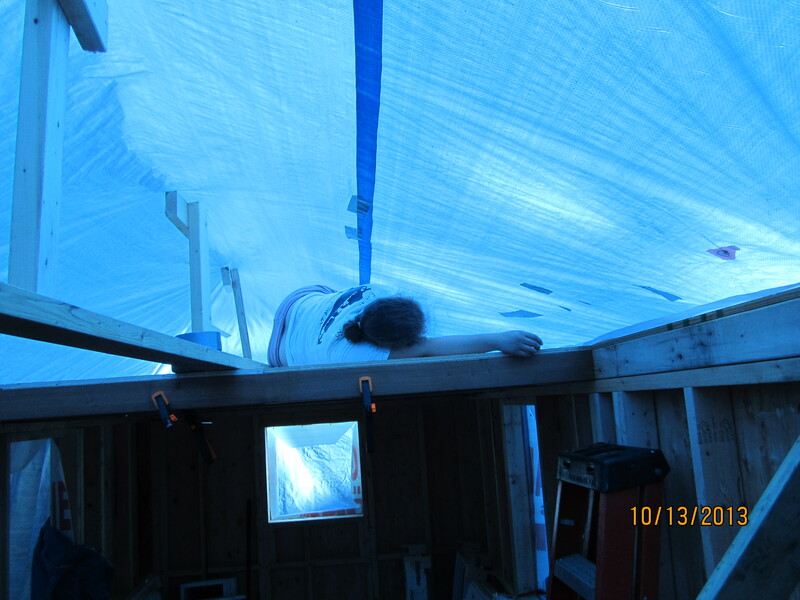 Sunday, we started tackling the dormer sides and I was up in the loft installing the siding. Saturday, I used a nail gun (the brad nailer) for the first time and Sunday I was manning the brad nailer. The dormer sides are slow going. 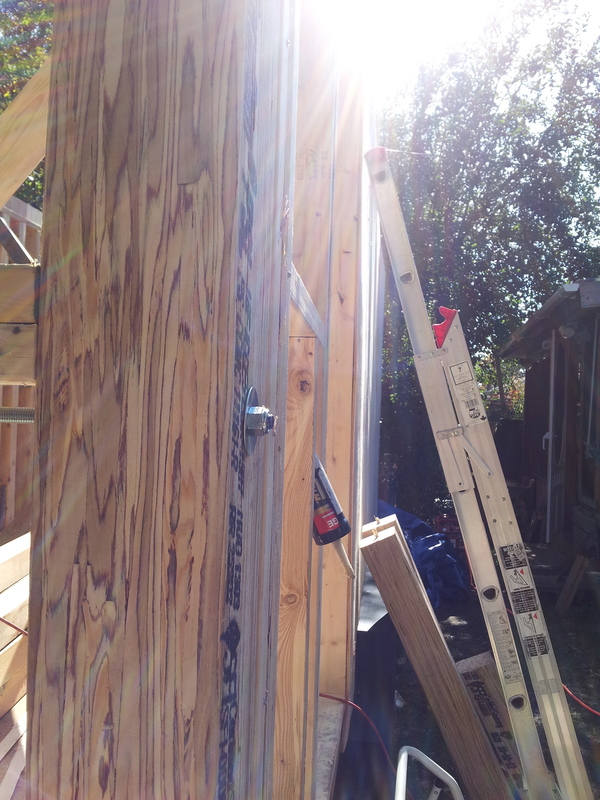 The angles are slightly different on each one and the top two pieces of siding require cuts on the table saw and the mitre saw. 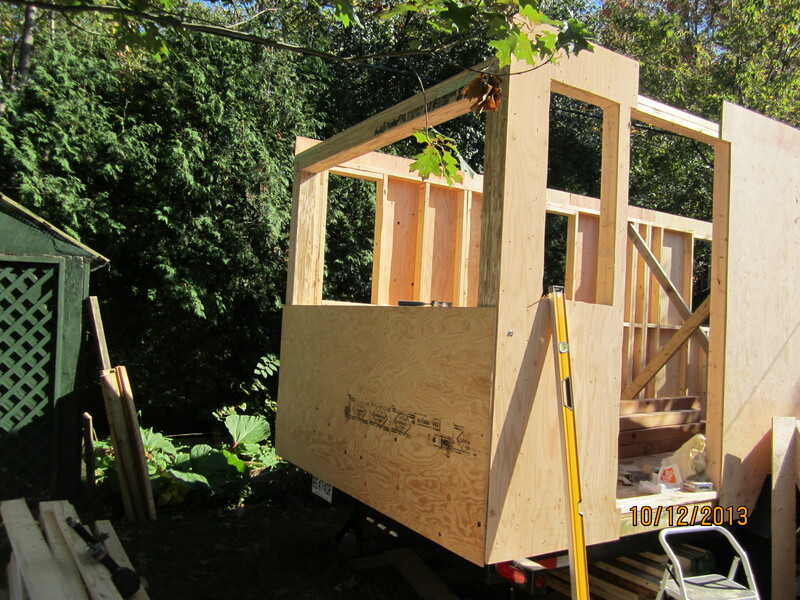 The tiny house only has space for the mitre saw, so the top two pieces required quite a few trips outside. We got 5 ½ dormers done and one of the small sections of 12/12 pitch ceiling done in the small loft. Next weekend: the dormer sides will get finished, as will the ceiling on the rest of the 12/12 ceiling. 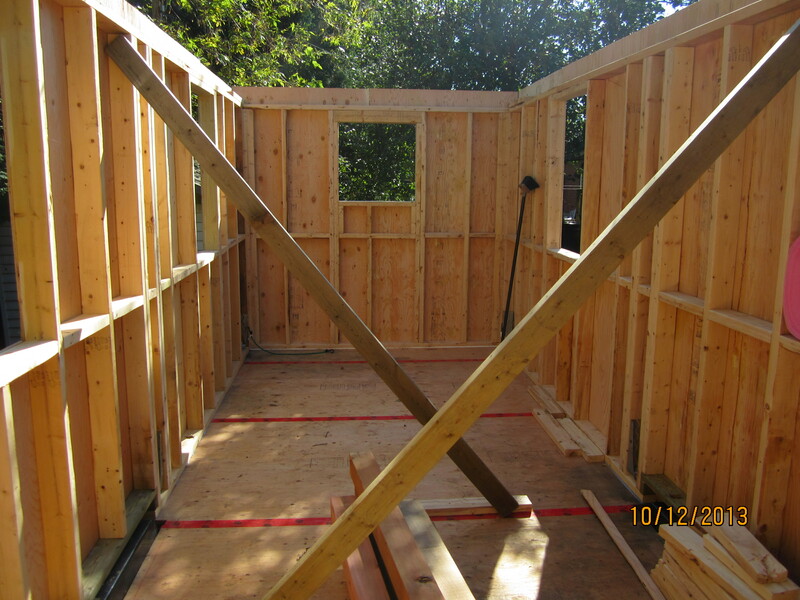 The bathroom wall will get built and sided and then we start on trim. Tiny Refuge is now insulated and very purple. One of the installers cleaning up. The bathroom, kitchen and main loft. The little window behind the door decked out in purple. This wall was built out so that it could be better insulated. Another built out wall insulated. 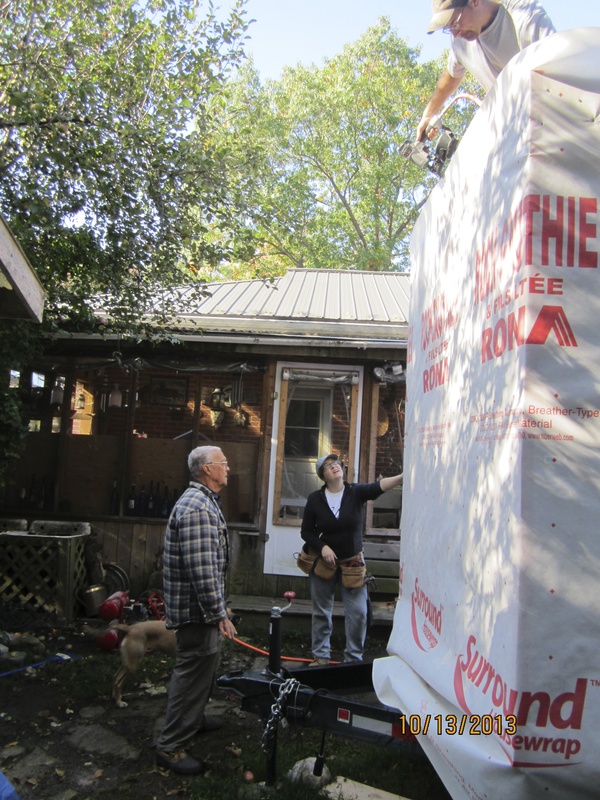 One step closer to insulating Tiny Refuge. 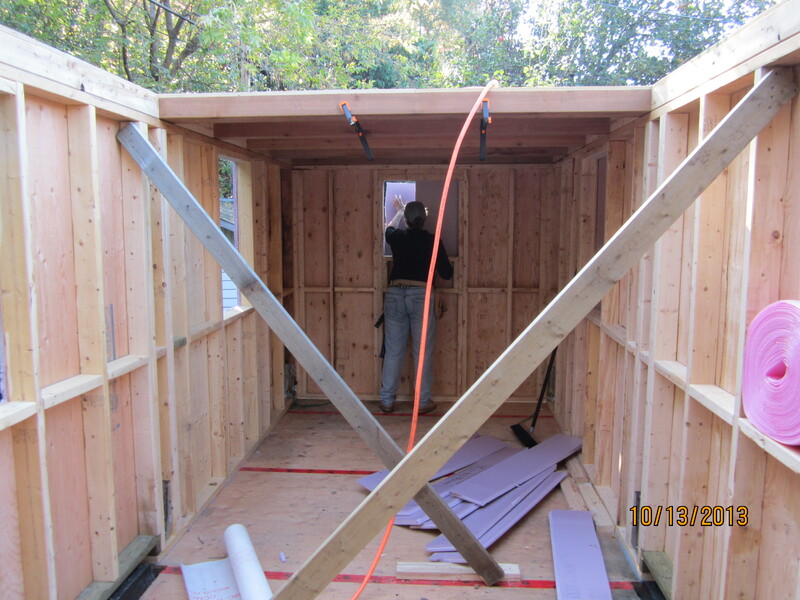 Once the insulation is done, we start putting up the interior siding. So exciting! Before I get ahead of myself, we completed the electrical rough in this weekend. The work this weekend was stalled a couple of times due to weather and we ran out of wire, who knew a tiny house would need more than 150m (almost 500ft) of 14/2 wire and then some 14/3 wire too. We worked on finishing the electrical rough in on Saturday and filling in the open spaces in the rafters with leftover rigid insulation so that the spray foam will stay in the house and not come out onto the exterior siding. First thing Sunday, I ran to Home Depot and picked up more wire so we could finish the wiring and Stefan started on the exterior plugs, inlets, the HRV placement, the furnace flue and the porch light. When I got back, I got continued with the wiring and insulating the gaps. My mother came and helped us in the afternoon protecting the outlet boxes and the windows by sealing them in plastic. 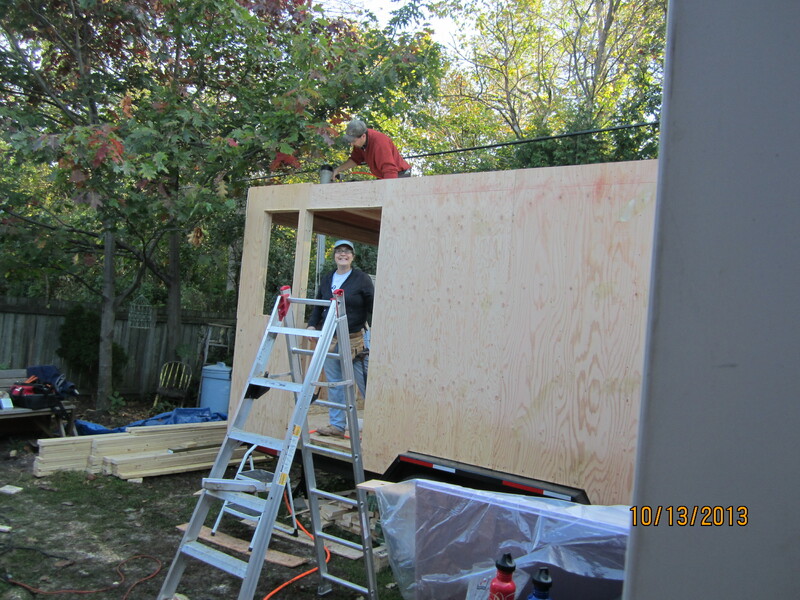 Stefan built out the sides of the dormers so that they can put in a full 3″ of insulation and then built the wheel well boxes. I was outside manning the mitre saw. It was above freezing, which was nice, but rather treacherous to walk as the snow on the ground had a decent layer of ice overtop and I ran out of salt to ice the path. Next up will be the propane rough in.